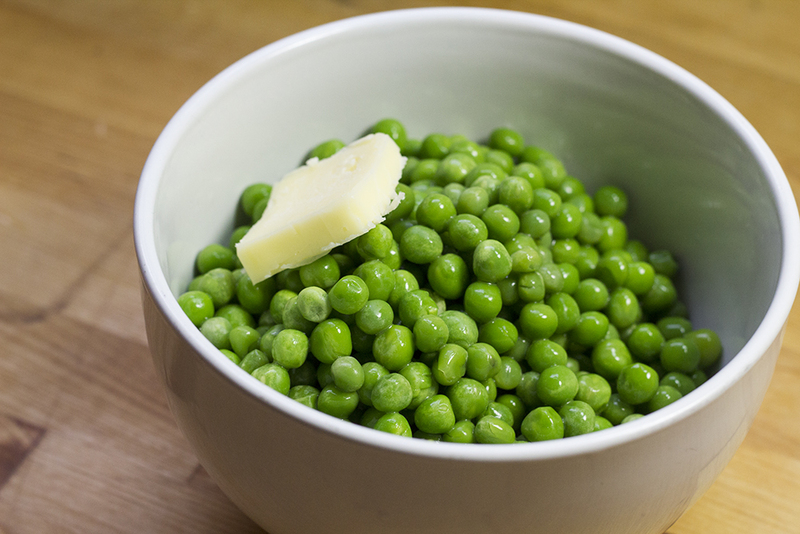 Well, this is peas month and I am British so I pretty much had to cook this at some point. 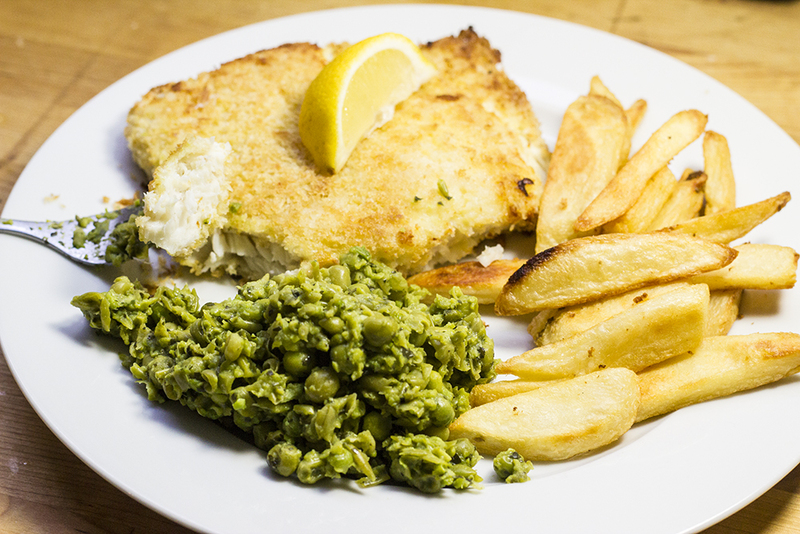 Although it is probably the most renowned British dish, it’s a long way from being my favorite and, in its authentic state (battered fish, greasy fries and overcooked peas from a fish n chip shop), I won’t even eat it! My version uses breadcrumbs (panko again) for the fish and I avoided boiling the peas into oblivion by mushing them with a hand blender before they reached the soggy stage. I especially like doing it this way because you can leave plenty of peas whole to give a bit of variety in texture and flavor. What can I say, I’m a lumpy mash kinda girl, if that’s not what you want then by all means, blend them into a puree. Preheat your oven to 450F and prepare a tray. Beat the egg in a small but wide bowl and add the juice from the lemon. Mix the zest from the lemon with the breadcrumbs and a pinch of salt to taste. Spread the breadcrumbs on a small plate or a piece of foil or baking paper. 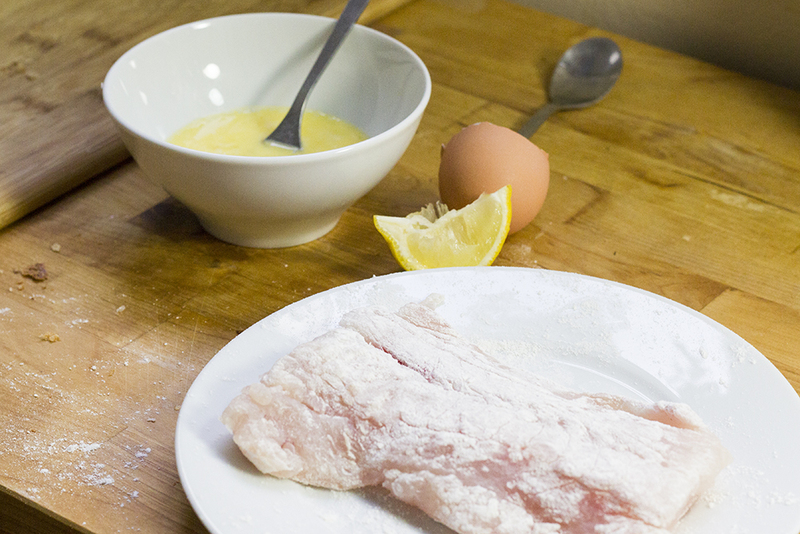 Dip the fish in the flour and then the egg mixture. Make sure it’s completely coated then press into the breadcrumbs, turning several times to press more breadcrumbs each time. You’d be surprised how much extra you can get on each time! Spray the breaded fish with the spray oil until it’s covered on both sides, then put the fish on the tray and bake for roughly 20 minutes depending on how thick your pieces of fish are. Cook the peas to your liking. Personally I stick mine in the microwave, with a little water and butter, for 2 minutes. Mush them with a fork if they’re soft enough or whizz them up with a blender. Mix in the mint and vinegar (or cheat and use mint sauce) and then serve straight away because they tend to go cold quickly. I’d love to say I made my own chips but I definitely didn’t. “Fries” baked in the oven are delicious but not the same, and I wanted a fairly quick dinner. Trying to fry or deep fry chips at home seems to result in the most disgusting, greasy (or burnt and raw), inedible chips ever. I’m sure I could do some research and experiment a bit to get some good ones but that is a challenge for another day. For this meal I used Ore-Ida Steak Fries. Yes, they do taste like oven chips but they are the nicest I’ve found. This entry was posted in Food and tagged Dinner, Easy, Fish, Healthy, Monthlyveg, Peas, Recipe. Bookmark the permalink. Yum I have been longing to make Fish and chips..Would definitely give it a go soon. Looks so delicious..Hope you had a happy tummy.Please do visit my blog too sometimes. Mmmm you definitely should! It’s pretty simple to make. Your blog looks beautiful, I’ll have to try out some of your recipes. Definitely give it a go, it’s super tasty and so quick too! This is just fantastic! 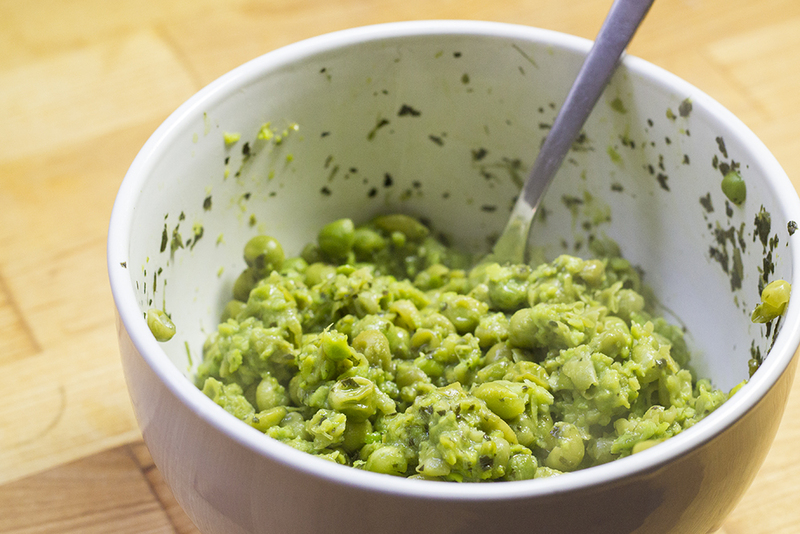 I’m American, and I’ve always heard of mushy peas, but I always felt like “why on earth would anybody eat mashed peas? ?” But your mushy peas actually look so wonderful I gotta make them for myself!! Aww awesome! They do have one thing going for them – they’re a lot easier to eat when they’re mashed! There’s definitely a wide range of tastes to them depending on how long the peas were cooked for so, if you generally prefer fresh vegetables with a little crunch left in them, I’d recommend cooking them my way rather than boiling them down till they practically mash themselves! I was lucky, my mum also prefers her veg on the crunchy side so I never really had to eat them yellow and soggy!